It was early Sunday afternoon, and I was taking off my shoes in our players’ lounge when I kept hearing my phone buzz. Someone was calling repeatedly. I immediately got an uneasy, sick feeling when I looked at the screen and saw who was calling. It was my close friend Missy. She was hysterical. My best friend in hockey, Steve Montador, was found dead in his home at age 35. Steve was a 12-year NHL vet who battled addiction at certain points in his career before getting sober. Since he walked away from the game due to concussions in 2013, he was struggling to figure out what to do next. But I was still in complete shock and disbelief. For some reason, I started getting dressed for the pre-game skate. As a hockey player, you’re just taught to push through the pain, no matter what. I started putting on my skates when I glanced across the room and saw the stall Monty used to sit in when we played together. I heard his deep, hearty laugh. I went to the trainers’ room to try and finish tying my skates without anyone noticing the tears. I didn’t want to be a distraction for the guys. It was a big game. I told JT, one of our trainers, what had happened. I tried to put on my best face and finish getting ready back at my locker. 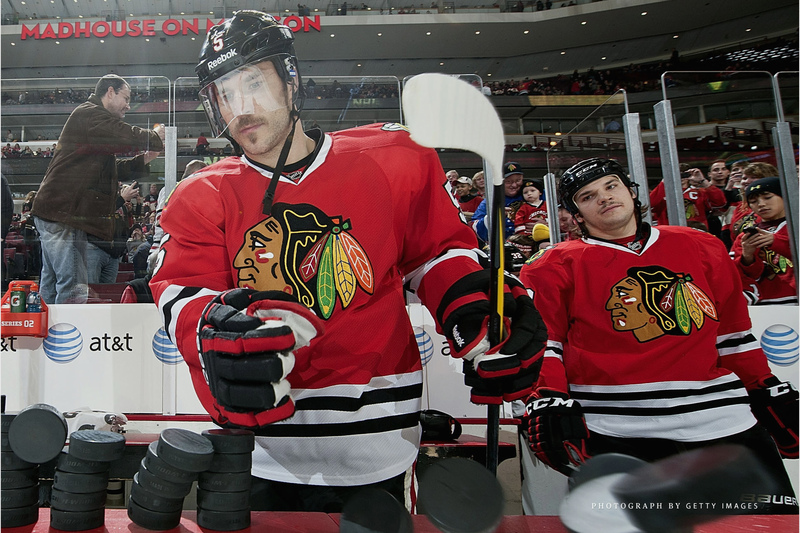 That’s when Johnny Toews noticed something wasn’t right. I don’t think I was doing a good job of hiding it. He pulled me back into the lounge and I told him what happened. Johnny hugged me and tried to calm me down. But I was inconsolable. I blew my nose, slammed some cold water and went out for warm up, telling everyone who asked that I’d be fine for the game. About five minutes into it, I was stretching by the bench and caught the eye of Pauly, one of our trainers. He must have just found out the news, too. His eyes looked sad. He could see I was hurting. I tried to take one more lap but failed to do so without breaking into tears. I walked down the tunnel and straight to the coach’s room and walked into Q’s office. They had just gotten the news about Monty as well. When I could finally speak, I told him I couldn’t play. I didn’t want to be a distraction. I got undressed and left the rink. I had so many thoughts and questions that needed answers. What had happened? Who was with him? Where was he? Is this real? This can’t be real. Why didn’t he reach out if something was wrong? My mind was racing. Over the days to come, I experienced emotions that I’d never felt before. I never realized my heart and soul could ache as it did from that kind of loss. I must have filled up 20 notepad pages. Then, I thought of a memory of Steve lathering himself up with Flexall gel after a pre-game workout and running into the locker room in his underwear. Anything to get a laugh. Anything to make other people happy. That was Steve. I started to laugh. I started to break down. Finally, I decided to sit down in front of a camera and try to explain why we can’t lose another Steve Montador.